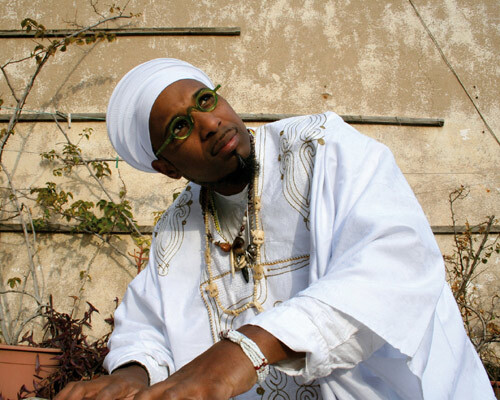 Cuban pianist, percussionist, composer and arranger Omar Sosa has a distinct musical vision: a pan-African sound that connects African and neo-African cultures in Europe and the New World. Over nearly the past two decades, Sosa has pursued it with remarkable clarity and consistency, freely drawing along the way from the culture, and the work of musicians, from places as disparate as North Africa, Cuba, and Ecuador, Paris and Oakland. A prolific artist, his work has already yielded 22 discs (and counting) to his name, including recordings of solo piano, duets, small groups and large ensembles. The recently released Ceremony, is yet another different setting for Sosa and his music. Here he is featured with his regular group and the NDR Big Band (NDR stands for Norddeutscher Rundfunk or North German Radio ). 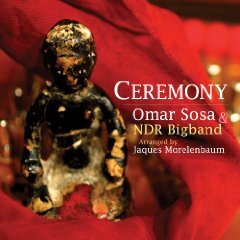 The material, all but two pieces a reworking of music from Sosa´s Spirit of the Roots (1998), Bembón (2000), and Afreecanos (2008), was translated for big band and directed by Brazilian cellist, arranger and conductor Jaques Morelenbaum. The results sound rich but lacking. A practitioner of the Yoruba-rooted religion known in North America as Santería, Sosa has at times set up his programs like musical services, roughly following the structure of a religious ritual. Echoing the set up of Spirits of the Roots in Ceremony, Sosa opens and closes the set with salutes to Elegba, the deity that in the Yoruba pantheon is the messenger, the trickster, the guardian of the crossroads. The rest of the tracks include both references to other Santería deities (and the rhythms associated with them) as well as nods to secular Cuban music styles such as the cha cha cha, the danzón, and the son. For all its intensity and complexities, Sosa´s music, especially his ensemble music, usually has an open feeling, and a lightness that seems to set it airborne at the gentlest push. The music in Ceremony does take flight at times, but the image is of a big cargo plane going up laboriously. Morelenbaum, who has collaborated with major artists including Tom Jobim, Caetano Veloso, Milton Nascimento, Egberto Gismonti and Riuychi Sakamoto, assigns the vocals in Sosa´s original versions to instrumental sections. It´s a logical solution, but as a result the music not only takes on a different, darker hue but also gains heft. Also, Sosa´s ensemble works are rowdy, untidy affairs, but brimming with vitality and humor. The NDR provides more precision than fire. They do what they do very well. But there is more to this music than what’s on the page. “Danzón de tus Ojos,” titled “Antes de ir va Esto” in Spirit of the Roots, is a case in point. It´s an elegant, sober and light danzón in its original version. Here, in a shorter version, it starts with a Vegas-sized orchestral exclamation point and a mournful cello melody, leading to a grander, heavier, and darker version. And in its big band translation “Luz en el Cielo” loses the spaciousness and gossamer quality of “Light in the Sky, ” the Afreecanos version. Rather than suggesting a certain open-air mystery, “Luz ..” feels urban and nocturnal and a tad too muscular. (Although it also does feature a beautifully paced solo by Sosa). Similarly on “Changó en Esmeraldas” (“Fabriciano con Changó”), “Yemaya en Agua Larga,” (“Agua Larga Pa’ Yemaya”) and “Carambabá” (“It’s My Head”) — all pieces from Spirit of the Roots that make explicit connections between Afro-Ecuadorian religion in Esmeraldas, Ecuador, and Afro-Cuban Santeria — the brass adaptations of the original vocals results in heavier, denser textures. Perhaps not surprisingly, the best fit between music and band is on “Monkuru,” an updating of “Remember Monk” from Spirit of the Roots. This version deviates from the original, but here the more familiar (jazz) language elicits very strong ensemble and solo playing and the results are satisfying on their own right. Still, to prefer earlier, non-big band versions of this pieces does not mean dismissing Ceremony. Sosa’s music is rich, his soloing is elegant, soulful and smartly structured terrific throughout, and this is an all around well-arranged and well-played recording. But if this is your first encounter with Sosa’s music be aware that there is a lot more in this music than these charts and these performances reveal. In his album notes, Sosa pays tribute to Mario Bauzá, Machito, Chico O’ Farrill, Bebo and Chucho Valdés, Chano Pozo, and Dizzy Gillespie, among others. There is a grand tradition of big bands in Afro-Cuban jazz. If Sosa decides this is another piece of his pan-African puzzle, it shouldn’t surprise anyone if – perhaps in a future album — he finds his own vocabulary and shakes up the big band sound. The instruments change but the vision remains — and he has found his own sound before. To see a video illustrating the production of “Ceremony,” click here.